Hunting, painting, hiding … who knew rocks could be so fun? Brooklynn Rohrscheib, 5, prepares her rocks for painting by covering with a white coat. She’s recently found a way to keep her son entertained — rock hunting. They found a painted rock on the Newburgh Riverfront a few weeks ago, and it’s been on ever since. “It gives him something to do besides just complaining about walking,” Embry said. Creative. Fun. Bonding time. Being outside. Exercise. Joy. For everyone. Most people in the Tri-State have nothing bad to say about the phenomenon that’s swept the area. Here, and across the country, finding, painting and then hiding rocks has captured the hearts of thousands. 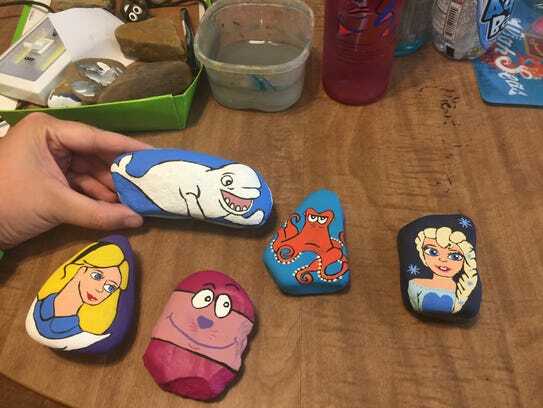 Some communities — such as Evansville, Princeton, Haubstadt and Henderson —all have Facebook pages dedicated to the adventures of painting and hiding the rocks. Each community plays the rock-hunting game a little differently. Princeton’s community focuses on kindness rocks, which have kind words written on the rocks to brighten up someone’s day. 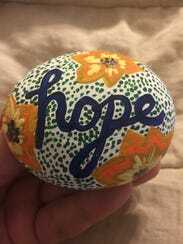 Evansville’s site, while it has its fair share of kindness rocks, often features posts of photos of rocks painted and clues as to where they can be found. Many of the rocks encourage the person who found it to check out the Facebook page with “Evansville Rocks” on the back. Many who find them post where they found the rock and where they plan to rehide it. Evansville Rocks! has more than 3,500 people in the group, including Embry. Her daughter found a Chicago Bears helmet and saw the Facebook group’s name on the back. She looked up the page and found what others in the area were doing with the rocks. While it’s keeping the little kids entertained, it’s also something everyone can enjoy. Families can rock hunt together. Adults even are having a good time with it. Amy DeVries told the Courier & Press that her job can leave her stressed at times. Search Hide- A-Rock In Henderson County for their page, which has nearly 590 fans. Even schools are joining in the action. 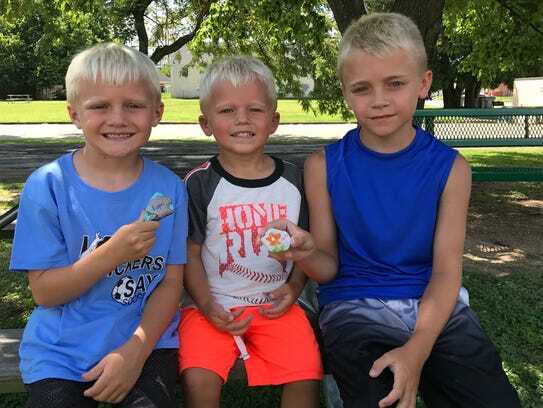 Henderson County Public Schools has a class that’s making the kindness rocks. Kate Emmert, a Henderson County High School teacher, said her class begin painting rocks to inspire or bring fellow students joy. “My kids thrive on making other people happy,” Emmert said. Last week was the beginning of the rock painting, and 10 rocks were hidden throughout the high school. 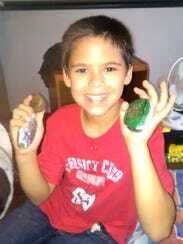 This week another set of rocks were painted and distributed in the community. “We’re trying to get people tweeting from town (about the rocks that the students painted) so it can be more of community-based activity,” she said. People can look at the rocks the students made using the hashtag #hchsrocks on Twitter or Facebook. Susan Todd: I’m so excited that the Kindness Rocks movement has made it to Evansville. I work at USI and am so excited about sharing the Kindness Rocks with our students. These small acts of kindness are so encouraging and lifting the spirits of those who find them. This semester I’ve been asked to be a guest speaker for some of our Freshman classes to introduce this movement as a Service Learning Project. I’ll be teaching the acrylic pour method that I use to the students as a way to paint kindness rocks. My favorite quote to go along with this movement is, “Throw Kindness like it was confetti.” I put that quote on the back of the rocks I paint. 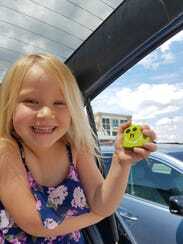 Darlene Hagerman: My daughter really loves it !! She just found her first rock last week and is already addicted to it. She has been begging me to buy her painting supplies (which we have) so she can begin hiding rocks as well as searching. We have gone searching for rocks three times this week since she accidentally found her first rock last weekend. I like this new hobby because she can do something that she likes (anything artsy) along with doing something nice for other people. It gives you a nice feeling when you find a rock that someone else made. It’s nice that she wants to make other people happy. It’s also good that it gets her outdoors & moving instead of just watching TV or playing on a phone. Anthony Mayes: Love that it’s not only bringing families together but the community as well, focusing people in our area on the others they share their community with which in they are showing that with all the negative things people are seeing and going through there is still so much love and peace that people aren’t seeing that’s there. Jana Wallerstedt: We love that it’s a treasure hunt. He gets so focused on finding rocks and hiding his after he paints them. Kristy Yoder: It’s keeping my son, who is almost four, active with the outside world. He enjoys going out to places and finding other people’s artwork even if it’s a tiny rock with a bit of spray ain’t on it from a construction site, he will still get excited! Everyone’s artwork on their rock is unique and different in their own way. It shows their personality and creativity. My son always thinks he is a pirate looking for that hidden treasure when we go rock hunting and when we find a rock he gets so excited and it brings a smile to our face. Ashley Johnson-Farmer: This is such a fun activity! I love being creative and having a positive impact on the community … makes it that much better. Brittany Rhodes: It gets us outside, and we get to be creative.. it really brightens people’s day when they find these Rocks! Some of these Rocks speak to us. I know when we found our first one we weren’t having the best day, and after finding it, it changed our whole day in a matter of seconds. We ran home looked up Evansville Rocks and have been going full force ever since. Daniele Johnson: We just moved here from Tennessee so we don’t know anyone. And this has been a huge inspiration for our family. Toni Bellomy: I love that this is an activity I can do with my daughters, and they both enjoy it. My oldest is 14, and she loves to join in too. The best part is that a lot of different people from the community are participating and some of the rocks are seriously amazing. Amber Barrow: We love seeing how our creations make other people smile! It also makes my kids excited about getting out and hunting for rocks. Karen Martin: Painting the rocks is a relaxing evening activity, and then hiding them gets us out and about walking. The best part though is watching someone find one or seeing your rock posted as “found” on Evansville Rocks! Carrie Devine: It’s such a fun and inexpensive activity that’s fun for the whole family. You can get the kids imagination and creativity flowing and then get them outside and exercising. My daughter loves the “secrecy” to hiding the rocks and is thrilled when she finds one from someone else. Sonya Lopez: I love that it’s a great way to get out of the house and exercise without the kids knowing. They get instant happiness in finding one. They also love the fact that some of their rocks are traveling to other areas, including Africa. We are keeping track and logging on a map exactly where they go. It’s a great learning tool for geographics. The positive messages are wonderful. Cheryl Loomis: I enjoy painting and hiding rocks and hope the rocks brighten the finders day. While I paint, I say a prayer for God to bless the person that finds the rock. It is inspiring to see how many people enjoy this activity. I hope it continues. Hollina Hill: I am a single mom of three children. It’s sometimes difficult to find things to do as a family that don’t cost an arm and a leg. Evansville rocks is something we can all enjoy, and do! Even my sister, niece and Mom have joined in on the fun. Misty Baggett: I love leaving rocks to brighten someone’s day. I especially love seeing the smiles on the finder’s face if they post to our page. It brightens my day too, and if they leave a comment I will reach out to them if requested. You never know what someone is going through and what something so small can mean to them. A simple act of kindness without any expectations in return. Love it!